As some of you may know, I have a little thing for vegetables. I lurve them. I munch them. I share the joy of veggies with kids. 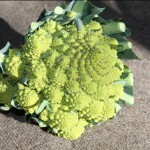 I shouted with joy when I saw this Romanescu. I’ve heard it called broccoli but it really tastes more like cauliflower. Anyway, the growth pattern is beautiful and illustrates fractals. First you can stare at it. Then you can eat it.